The public board that oversees Mayo Regional Hospital in Dover-Foxcroft will vote next week on whether to go forward with a proposed merger with Northern Light Health, the statewide health care system that’s based in Brewer and includes Northern Light Eastern Maine Medical Center in Bangor. Administrators of the Piscataquis County hospital say that joining the larger system will help it stay afloat after years of financial struggles. The hospital — which is overseen by a quasi-municipal entity known as Hospital Administrative District No. 4 — has had operating losses every year since 2010, according to president and CEO Marie Vienneau. While the hospital district has $13.7 million in a reserve fund, according to its most recent balance sheet, Vienneau said Mayo also has $9 million in debt, a $1 million line of credit and zero days of operating cash on hand. The district has tried to preserve those reserves, she said, but if the merger were to happen, they would probably be used to offset the hospital’s debts. At 5:30 p.m. Wednesday, the board will meet at the hospital to vote on a preliminary merger agreement. If it passes, several other key steps would then have to be taken before the two organizations could merge, including approval by the Northern Light board and state regulators. Administrators also say the district’s charter would need to be changed for the merger to continue, which would require an act of the Legislature. But the terms of that proposed merger agreement still aren’t clear. In an interview, Vienneau declined to provide a copy of the document, saying that it will become public after the vote. As of Saturday morning, hospital representatives had not responded to a request for it under Maine’s Freedom of Access Act that the BDN sent Friday. The members of the Hospital Administrative District 4 board are all elected from Piscataquis County communities and hold meetings that are open to the public. The district also has taxing authority. Now, one board member remains concerned about the lack of transparency in the process after he sued the district last fall seeking more information about the proposed merger agreement. While the lawsuit by Gerald S. Nessmann of Sebec hasn’t been resolved, a judge has since lifted a temporary restraining order that he placed on the merger as a result of the legal action. Nessmann said he’s not inherently opposed to the merger, but he still doesn’t think the proposed merger agreement has received a proper public airing. As a board member, he said that he only received a copy of the agreement midway through this past week. He said that timing left him with about a week to review the approximately 160-page document before it comes up for a vote at Wednesday’s meeting. Vienneau said the merger agreement that’s being considered Wednesday night would be an important step in moving the hospital to stable financial ground and that the district has been discussing the agreement with Northern Light since 2015 — when the latter organization was still called Eastern Maine Healthcare Systems. Vienneau declined to respond to Nessmann’s specific arguments, saying she can’t comment on pending litigation. But she said that members of the Hospital Administrative District No. 4 board have carefully reviewed the merger agreement, sought public input and decided it’s the best way to continue offering health care in the region. Wednesday’s vote was called by the board’s executive committee, which met early this past week. The proposed agreement is “non-binding,” Vienneau said, because various other approvals would be needed before the merger could be finalized. Among those would be a change to the state law that created the district in 1973. Vienneau said hospital officials have been discussing such a change with state lawmakers, though no legislation has been submitted to change the law. For Hospital Administrative District No. 4 to be dissolved, all of its member towns must vote to approve the dissolution, according to that state law. Under the law, hospital assets are to be divided proportionally among member towns following the dissolution. The district’s member communities are Abbot, Atkinson, Bradford, Cambridge, Dexter, Dover-Foxcroft, Guilford, Milo, Monson, Parkman, Sangerville, Sebec and Willimantic. It’s now the only hospital administrative district remaining in the state. 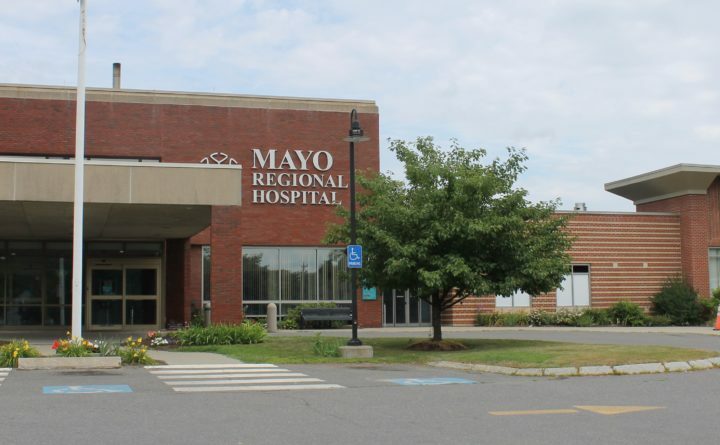 Mayo is a 25-bed critical access hospital and health system, according to its website. It has five rural health clinics throughout the region — though one, in Guilford, is slated to close in April — and provides emergency medical services for all of Piscataquis County along with various other services. Under the proposed merger, administrators hope to convert Hospital Administrative District No. 4 into a nonprofit organization that would still oversee the hospital, but no longer have taxing authority over the member communities. Vienneau said she doesn’t know whether any proposed legislation would preserve the right of member towns to individually vote on ending the district.